Tuesday is climbing day no matter which country you are in. A swing bridge over the Pelorus River started the day, dodging a wasp nest right next to the swing bridge entry where you have to manoeuvre under some wires without getting your pack caught up. The forest is full of wasps, the european variety that we have at home, but they behave more like flies. With some much food around they are not that interested in humans and are easily swatted away, although I was cautious near the nest to be sure. Once over the river it was up and up and up. This was going to be the theme for the day. It was overcast but hot and humid under the tree canopy with no wind to speak of. The trail lead through another nice beech forest following a ridge line up, always up to Rocks Hut. Lots of roots to act as steps. I reached Rocks hut by 9:30am in 2 hours and well under the estimated DOC time. That was great. From Rocks Hut the terrain changed to become much more rocky and entered into drier vegetation, lots of heathy type plants and manuka for a good chunk. The trail was undulating, following ridge lines up and down. Just before a reaching a high point there was a major windfall area. Not quite sure how big but easily close to 100ha in total. Tall beech trees blown out of the shallow shally soil, with massive root balls towering above my head and trees scattered ontop of each other like a giant game of pick up sticks. It looked like a logging coupe. Somehow the good folk at DOC have managed to saw and clear a path through. I must have walked through this area on and off for around 40mins and several sides of the path were 2 to 3 metres high of fallen timber. 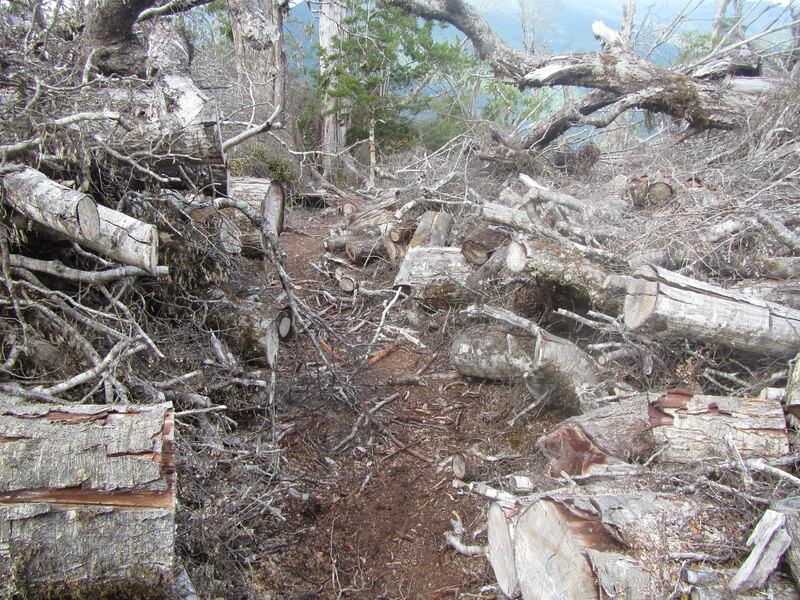 Hats off to the crew that cut this path – a major undertaking for sure and good chainsaw work. Leaving the wind fall area and climbing again I could see a break in the vegetation ahead. There was a clear line in the ground changing from forest to grassy, stunted plants. This marked the approach into a section of a mineral belt. Obviously the change in soils affecting what would grow there. It was open country. Purple and black rock littering the surface, with grasses and tussocks growing from the few pockets where debris had collected and allowed the formation of soil. From here it was down, very steeply down, to Totara Saddle, and down, down, steeper again to Browning Hut. I reached Browning hut around 1:30pm for some lunch and was joined shortly later by Ben. It was early in the day and I had several options for the afternoon but it all came down to time and how I was feeling. I told myself that if I reached the next hut, Hacket Hut, by 3pm I would aim to push on to Starveall Hut. The trail towards Hacket Hut followed the Browning Stream and required the odd crossing of what I would call a river, not a stream. A low water level and flood track higher up the bank provided options. I chose the river track. Well I reached Hacket Hut in good time and I was feeling good so decided to push on. The next section was expected to take 4.5 hours according to DOC and required multiple river crossings of the Hacket Creek. Then leaving the river the trail was to climb some 900m in elevation over 4 kilometres. I judged that I was making faster progress than all DOC times to date and that even if this section was to take the full recommended time, I would still reach Starveall Hut in day light. I pressed on. Following the river, I can’t judge this thing to be a creek, was amazing. It was large with lots of flow down deep channels between boulders, the banks lined with smaller pebbles. I didn’t count just how many crossings were required but I would guess maybe 10. Trail arrows were well placed and easy to follow with big arse arrows on the opposite banks indicating a crossing, but they weren’t always in the best spots. Several times I would travel above or below the arrows to find the best crossing point. I managed to find crossing points at each location, bouncing from boulder to boulder and stabilising my balance with my walking poles and was able to keep my feet dry for the whole section. Then it as up and up and up to start the 900m ascent. I told you this was the theme for the day. Tuesday night is climbing night after all and it doesnt matter which country you are in. Climbing, climbing, climbing. Turned out to be one of the toughest days to date. Just with the heat, the constant ascent, sheer in places requiring all four limbs, always up. I have never sweated or drank so much water in my life, not even on the fire line I don’t think. I would have consumed more than 5 or 6 litres throughout the day. Scared of going hyponatremic I had to fish out the rehydration salts. Constantly filling water bottles at every stream crossing. Up and up and up it continued. Finally breaking out of the trees I stumbled into Starveall Hut exhausted. My clothes were saturated with sweat and I needed to get the fire going to dry them out, my first fire on this trip. I have the hut to myself, with all the other trampers sensible enough to leave this ascent for tomorrow. The hut sits just above the treeline in the alpine environment and I’m sure the fire will help make for a good nights sleep. No problem there I don’t think – I’m knackered. Long, long day. I was keen it get this climb out the way. Otherwise it would be straight into it tomorrow morning with the same outcome. By climbing high today, I’m hoping to make best use of the current weather window. Aiming to get over Rintoul tomorrow before forecast rain which will make an attempt impossible. Bet you slept well that night. Travel well.